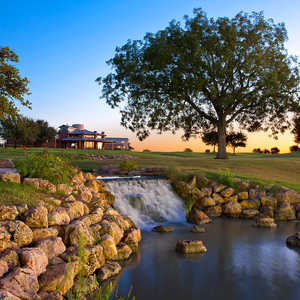 Leander, TX - Crystal Falls Golf Course, just 25 miles northwest of Austin, is one of most scenic golf courses in the Austin area. Those scenic views and tough design also make it one of the most challenging Central Texas has to offer. The first of many challenges occurs on the par-5, first hole. This 502-yarder sets the stage for the rest of your round. Although the first fairway is relatively wide, there is trouble in the form of trees to the right, which run between the Nos. 1 and 9 fairways, and to the left, which also include some brush. Local knowledge, which is essential on this course, advises you to place your tee shot on the extreme left side of the sloping left-to-right fairway because anything that hits in the middle or right of center will likely roll off the fairway and possibly into the trees. No. 1 is just one example of an extremely sloped fairway at Crystal Falls. No. 12 is probably the most difficult fairway on the entire course, and several other holes have sloped fairways featured prominently in their layout. Because of this tough design golfers have raised questions about its fairness. However, head professional Woody Arnold said the sloped fairways are just an additional challenge and for those who can hit it straight, it doesn't pose that big of a problem. Arnold adds, "The average guy fades or slices the ball and mainly you're playing a course that sets up left to right. So if you're hitting the ball left-to-right then that adds to the problem and it sends the ball into the creekbeds or wherever." "Wherever" can be anything from cliffs to tall grass and rocks, but it does not include bunkers. Crystal Falls is without sand. In those creekbeds, which come into play on almost half the holes, water is not a factor because of the recent drought. Finding the ball is the bigger chore. If the ball is found, the brush and native plants make your shot out difficult if not impossible. 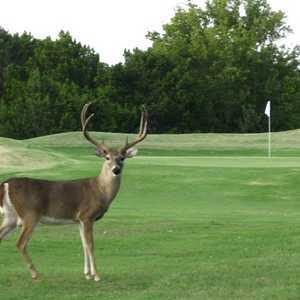 Be careful when looking for your ball in these areas because snakes and other creatures consider this their habitat. Wild turkeys and deer are not uncommon in the surrounding countryside, while snakes and the occasional mountain lion have made their presence known at one time or another. Although not a factor in the creekbeds, water does come into play on several holes including the par-3 second, which is one of two signature holes on the course. This 164-yard hole, as well as No. 11, provide you with a spectacular view off the tee of the surrounding landscape and demonstrate how carefully the natural topography was incorporated into the Jack Miller-designed course. No. 2 features a drop of approximately 125 feet to the Bermuda grass green that is only visible from the forward tee boxes and has water behind and to the right. From the back boxes, you must check the flag location and pick out a spot to shoot at in the surrounding landscape. Nos. 4 and 6 are the epitome of Crystal Falls, which opened in August of 1990 and hosts 35,000 rounds per year. Both holes feature sloped Bermuda grass fairways and greens that are nowhere in site off the tee. Although they can be difficult, an accurate drive off the tee rewards you with a good chance at par. No. 4 is a 410-yard double-dogleg to the right. Off the elevated tee you hit to a fairway that slopes left to right and has a small pond and creek that runs along the right. A solid shot to the top side of the first dogleg will roll back into the fairway and past several trees on the right and give you a shot with a middle iron to the green, which sits on the other side of the creek. No. 6 is a completely blind tee shot to a ridge. A rock wall with trees on top sits to the right and another rock wall with more trees drops below the fairway to the left. It is imperative to hit a straight shot just to the right of the middle of this fairway - with either a long iron or a wood. After clearing the ridge, the fairway opens up and is downhill to the green that has a group of trees along the right. A solid shot off the tee will put you within 150 yards of the green. No. 7 is a tough par 5 that starts you back toward the clubhouse. This 510-yard dogleg right is tight off the tee with trees and brush to the right, and a large tree on the left side of the fairway at the bend. Ideally, your tee shot is just to the right of the tree and will land and roll up the hill and back down on this left-to-right sloping fairway. Don't be brazen on your second shot. Lay up with a high to mid-iron to the left side of the fairway (Note: Your ball will roll right but large mounds have been built in to the fairway to prevent balls from rolling into the brush.) and you will have a 9-iron or pitching wedge over the ravine to the green, which has water in front and along the right. Heading in to the clubhouse, No. 8 is a 161-yard, par 3 over water to a green, which like most others on the course is medium in size with moderate undulation. To finish off the front, No. 9 is a 430-yard dogleg-left that is challenging and as a result is rated the no. 1 handicapped hole at Crystal Falls. The tee shot is to a fairway with trees to the right and left and a creek to the left. The fairway slopes from right-to-left so a good drive should be hit to the right side of the fairway. Your second shot will require a long iron to the narrow green that is protected by trees and the creek, which crosses in front and runs along the right side of the green, and a large hill and trees to the left. On the back nine the other signature hole is the par-3 No. 11 that measures 192 yards from the back tees and is a launch pad to a green almost 200 feet below. 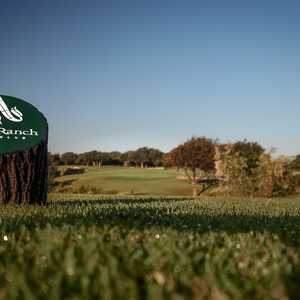 While you wait for your turn off the tee, enjoy the beautiful Texas Hill Country. When you hit, you can watch your ball as gravity pulls it back to earth to a green that has mounds to the right and left that funnel shots toward the center of the green. After the spectacular view of No. 11, you are quickly brought back down to earth on No. 12. Although this is the no. 8 handicap hole, it plays much more difficult. The hole, like much of the course, is lined with trees on both sides of its 506 yards. It also has a creekbed to the right. Add into the mix a fairway that slopes hard left-to-right until the last 150 yards to the green and you have one of, if not, the most difficult hole on Crystal Falls 6,654-yard layout. If you manage to finish the hole with the same ball you hit off the tee, much less scoring par, you've done well. Although Arnold agrees that holes such as No. 12 can play difficult, he defends the course. "There's beauty and challenge on this course. Golf is supposed to be a challenge. It's kind of like life; you got a lot of ups and downs and a lot of rough areas. It's a great course to battle nature and yourself with the challenge of hitting straight shots and hitting off sidehill lies." He said to overcome some of these challenges and help those unfamiliar with the course, the Uplink GPS comes with each cart. This GPS course management system features an in-cart display that provides details of each hole including overview graphics of the layout as well as distances to the center of the green and key hazards. To finish out your round, you have one final challenge - No. 18. Off the tee, this 549-yard, par-5 hole offers a fairly wide fairway, which slopes severely left-to-right. Berms have been built on the right side to prevent balls from rolling off into the canyon. Your second shot should be a middle iron to a lay-up position before the creek that crosses in front of the green, which sits below the fairway. When you finish your round at Crystal Falls, you definitely have a greater appreciation for the Hill Country and its beauty. In fact, Arnold said some golfers come out just for the views. "I've been told by some golfers that they like to come out early and watch the sun come up over the hills and that they don't worry about their scores." Might be better off with that approach. Directions: Take 183 north through Cedar Park and past FM 1431. Turn left at Crystal Falls Parkway and follow signs.